Could Biophilic Design Make You More Productive at Work? Human beings are no longer outdoor animals. We spend the overwhelming majority of our time indoors or in cars. Researchers are only beginning to understand the effects this has on our overall health and wellness. For instance, patients recovering from surgery tend to go home sooner when kept in hospital rooms with a window. Studies have long shown that spending time in a forest can lower blood pressure and stress while improving immune function. This should make sense for most Canadians. From camping, hiking, fishing, and climbing, the great outdoors forms an iconic touchstone for the Canadian identity. However, we still spend the vast majority of our time stuck in stuffy gray offices devoid of the vibrancy and colour the outdoors offers. That may soon change. Architects and interior designers are starting to engage in a new sustainable framework called biophilic design that seeks to blur the distinction between the great outdoors and the great indoors. Biophilic design seeks to reconnect nature with our modern indoor life. The fundamental premise is that the human species and its ancestors have spent millions of years in adaptive response to natural structures and features and that these things have a pronounced effect on our psychological state of well-being. In its purest sense, this explains why a corporate leader may prize a massive writing desk made of rich mahogany and disdain its cheap, plastic alternative. But biophilic design goes much further than that. It emphasizes the natural setting over the isolated occurrence of natural materials – so a mahogany desk in a drywall boardroom with a plastic chair doesn’t cut it. Biophilic design seeks to place artificial human necessities within the context of lush, natural environments to foster interactions between human beings and their larger environment. It’s throwing out your potted plants and planting an entire indoor forest as Amazon did. It focuses on interior design elements that offer a direct experience of nature. It allows indoor areas to experience the dynamics of natural light, air, water, plants, and even animals. At the same time, it eschews images of nature and natural-like artificial materials that merely simulate the natural environment. Does Biophilic Design Really Impact Productivity? While most office managers will readily agree that having a beautiful, natural office interior is a good thing, it takes concrete arguments to win over corporate purse holders. In this case, good things must translate to a better bottom line. Plants may not have HEPA filters attached to them, but they are nature’s air cleaners and do an excellent job removing toxins from the air and diffusing oxygen. The combination of indoor plants and the humidity required to keep them healthy creates a natural-feeling environment that relieves stress and inspires the way no drab office landscape can. Clutter kills creativity. Sterile work environments are more prone to clutter than natural-inspired environments that call to mind the deep peace of a forest or a gently running stream. Instead of cleaning the office environment into sterility, these environments inspire people to be more creative. A natural environment does this by taxing their prefrontal cortex – the part of the brain that visualizes organizational structures – less than a corporate environment can. Inspiring surroundings are vital to improving mood and focus. It is clear that focused employees with a positive mindset are going to work harder and more efficiently than those who feel stressed or unhappy. 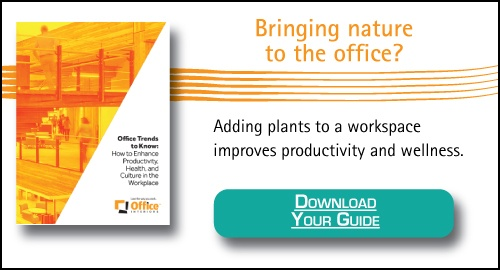 The biophilic workspace inspires greater productivity through the reduction of stress and fatigue. Is Biophilic Design Feasible for Your Office? While global enterprises like Amazon are investing billions of dollars in biophilic design for their offices, it can seem like implementing your own biophilic office is out of your budget. But while not every office can match the grandeur of Amazon’s Spheres, there are small steps that every office can take to incorporate biophilic design into the workplace. Inexpensive options for biophilic design can even save money compared to artificial alternatives. 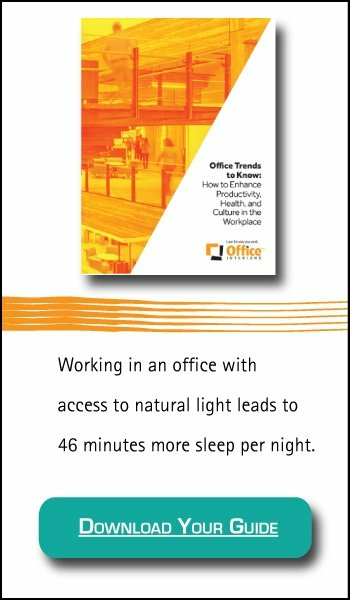 Relying on natural light is a simple way to reduce lighting costs. Indoor plants not only clean air without using electricity the way air purifiers do, but they also control temperature and humidity, reducing the overall need for indoor climate control. Enjoying these benefits requires expert consulting with a biophilic design expert who can develop solutions to meet any budget. An interior designer who understands the concerns that office managers have when approaching biophilic design can identify solutions for making biophilic design affordable under nearly any circumstance. Looking for more ways to improve your workspace? Here are Eight Ways to Make Your Office More Inspiring!